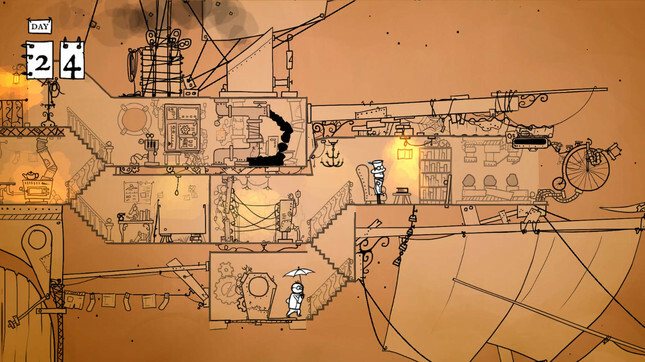 Kiwi-made co-operative steampunk puzzle-adventure 39 Days to Mars will launch for Windows, Mac and Linux on April 25, developer It's Anecdotal has announced. Created by Christchurch-based Philip Buchanan, 39 Days raised NZ$3424 via Kickstarter in early 2014, and then worked its way through Steam's Greenlight programme. Billed as a co-op steampunk puzzle-adventure game, 39 Days to Mars is set in an alternate reality some 150 years in the past. You play as Sir Albert Wickes and The Right Honourable Clarence Baxter, two 19th century explorers who are piloting the HMS Fearful – "a masterpiece of unreliable engineering" – on its maiden voyage to Mars. Single-player adventuring and puzzle-solving can be had as well, with the ship's computer-controlled cat there to keep you company. "When the steam engine runs out of coal, the ship's aforementioned cat shreds the navigation chart, and the tea gets cold, it becomes clear that interstellar transportation isn't a walk in the park," said It's Anecdotal. "It will take the talents of two working together on a mix of puzzles and action sequences to get to Mars in one piece (let alone in 39 days)." 39 Days to Mars will cost NZ$14.99, with a right proper discount planned for launch week. The game's Steam page is live, so you can pop it on your wishlist at your leisure. Buchanan previously worked on Lara Croft GO and Hitman GO. His aim is to produce concise games that give memorable experiences and have strong atmosphere. You can check out his website here, his Discord here, and follow him on Twitter here.